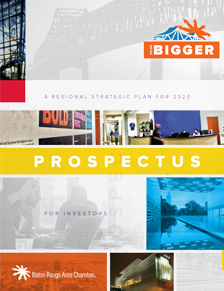 Think Bigger, a five-year regional strategic plan, was developed through stakeholder input, focused research and the guidance of a planning committee comprised of business and civic leaders. It’s aggressive, it’s bold and it sets out to achieve ambitious milestones the region must attain in order to compete and prosper. While the Baton Rouge Area has achieved much in the last decade, it is time to raise the proverbial bar and set higher expectations for the Baton Rouge Area. It’s time to Think Bigger. Think Bigger has many investors and continues to grow. Become a campaign investor today. 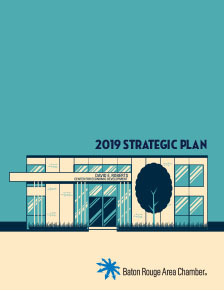 The vision for the strategic plan is outlined in the Think Bigger prospectus and progress on its initiatives and programs is reported in the quarterly publication, Catalyst .